The more I think about the role of social media in our lives, the more I think it’s necessary to look at it as the entrypoint. Sure, the ways to harness the power of social media and understand its impacts and uses are still being explored and developed, but it’s an emerging trend that can’t be ignored. Those that start to look at business through this lens will be staying ahead of the curve. The phrase that keeps coming to my mind is “the enemy’s gate is down”. For those that aren’t familiar with the reference, it’s from Ender’s Game, a great piece of science fiction. In the book, Ender and his fellow soldiers-in-training engage in mock battles in a round, zero-gravity war room. The 2 teams enter from doors on either side of the sphere, with the goal of reaching and capturing the opposing team’s side (“gate”). At one point, Ender realizes that since there is no gravity, there’s no reason to think of the opposing team’s side as being in front of them… by reorienting his body with his feet pointed towards the enemy’s gate, the direction becomes ‘down’, not ‘ahead’. The point is, I’ve begun to look at social media in the same way… completely reorienting the way I see it’s role in how we do things. It’s not simply a “fad” or a “marketing tool”: it’s become a completely new way that humans are communicating, and it’s not going away. We’re able to connect in a way that’s never been able to be done before, and certainly not at this level. We’re never going to revert back to the old way. We’re still just scratching the surface of learning how to use the social web for mass collaboration and social change, and the better the software platforms and apps get to allow us to connect and share and communicate, the more disruptive the changes will be. Understanding the social web = the enemy’s gate is down. update: ok, i removed the word “enemy”… the allusion was to the idea that reorientation can lead to new ways of understanding things and ‘aha’ moments, not that the web is the enemy. 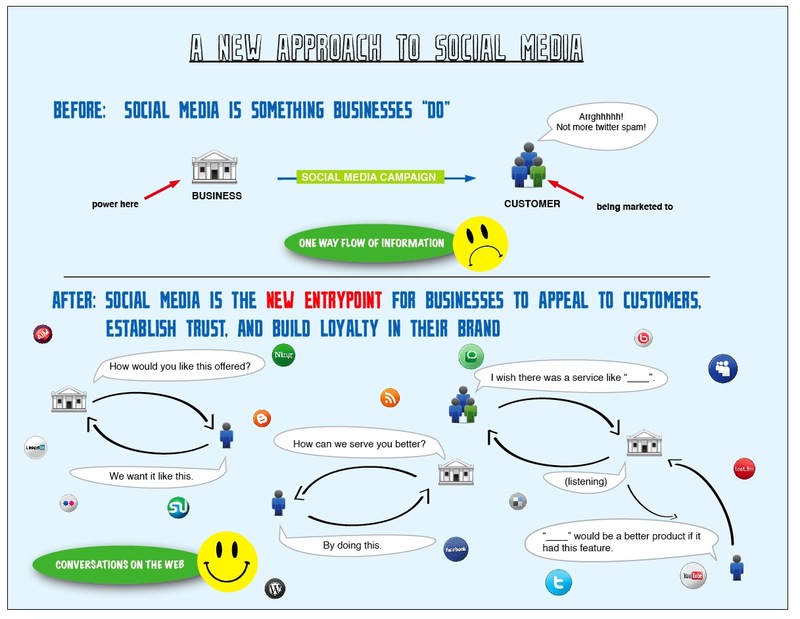 A New Approach to Social Media by Venessa Miemis is licensed under a Creative Commons Attribution-Noncommercial 3.0 United States License. Based on a work at emergentbydesign.com. Pingback: Twitter is not Social Media!